If you have some really popular posts on your website that are performing well in terms of attracting visitors, but not doing much else for your business, you can optimise your popular blog posts to get this wonderful content you have created actually working for you and driving business. Optimising your most popular website blog posts or articles can have great results in terms of increased conversions, new customers, and improved shareability not to mention great search ranking juice. To find your most popular blog posts, log in to your Google Analytics account and go to Behaviour > Site Content > All Pages. Scroll through the results to find your top performing posts. Before you jump in an optimise your popular blog posts receiving the most amount of hits, take a look at the time users are spending on that page (on average) and also what percentage are then leaving your site after viewing this content (bounce and exit rates). After you optimise your popular blog posts you can go back and review your analytics stats to check that your changes have improved readability, conversions, or that your posts are encouraging visitors to explore your site further. Now that you have your short list of popular posts, head over to your website and start optimising. What does optimising even mean? It means that you make changes to enhance the content, encourage users into or further down your sales funnel, attract more visitors and basically do everything you can to squeeze as much goodness out of the post to your advantage. 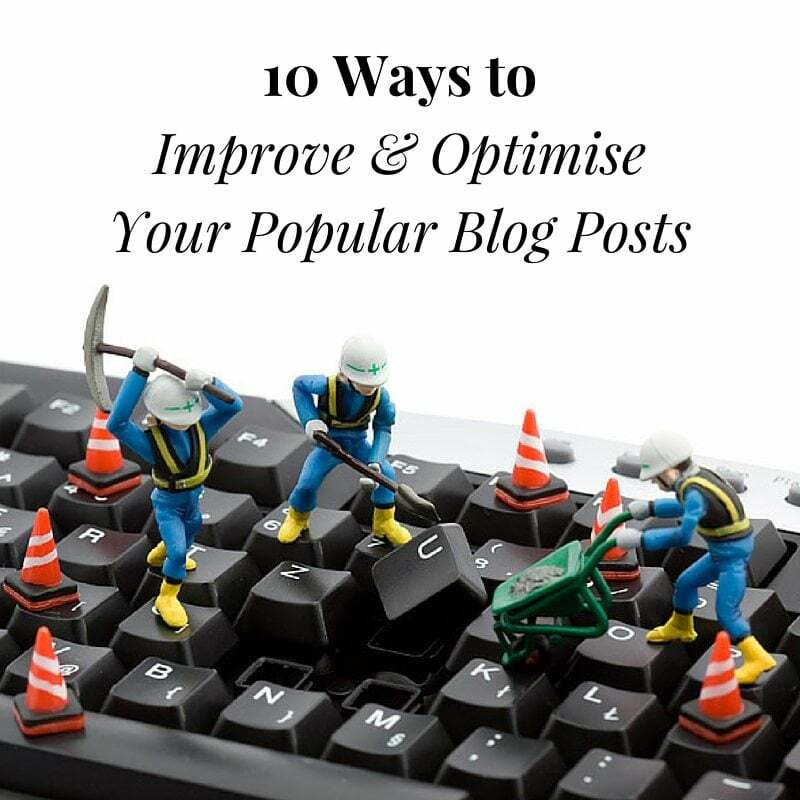 Here are 10 great ways to optimise your popular posts to your advantage. Look at your analytics for that page (Behaviour > Site Content > All Pages > (your top post). Then apply secondary dimension Acquisition > Source/Medium) to see where the page traffic is coming from. For example: If you notice your post is doing well with referrals from other blogs, try sharing the post through your social channels to drive traffic from similar audiences there. If your post is doing well on Facebook and Twitter, perhaps add some appropriate imagery or an infographic to your post to engage traffic from Pinterest and Instagram. If your post is doing well from organic referrals try paid search promotion to increase visitors. From your analytics report you can ascertain where the posts are working well and where your opportunities for growth are. Obviously, you’re already on the right track with this post or it wouldn’t be getting so much traffic. However, take a look at the keywords people are using when they arrive on that page and find ways to naturally include those words in your post. Use those keywords to label and tag your images as well as add them in the post tags. You can also improve the on-page SEO with appropriate keyword rich headings, easy to navigate and read content, mobile responsive content, optimised keyword density, short and long-tail keyword optimisation, cross-links and relevant meta descriptions for the page. If it’s a popular post that means it’s providing value for the reader, explore how you could share this content in other locations on the web such as other blogs, forum contributions and the like. This process of external content sharing can drive back-links (great for SEO) and also to demonstrate your knowledge and connect with new audiences. Just make sure that you do this all above board and only place your content and links in relevant locations for your audience. If the post is proving popular, take advantage of that engagement and re-share the posts with your social networks again. If the posts are significantly popular, use the post content in paid advertising on social channels to encourage more traffic and sharing. This is a great opportunity to increase subscriptions or encourage visitors to buy into your services related to the blog post topic. Add call to action advertisements or text in the post. If the visitors like the post they may be interested in more of what you have to offer. At the end of your post, add a related posts plug-in to send readers to other relevant content on your site. Within the copy itself, where relevant keywords are listed, add cross-links to other pages, categories and posts in your site. This way you can use your popular post to send readers all over your blog and boost credibility of the linked pages. Don’t over do it with the links though, you dont want to distract the reader and confuse your original message. If you’re experiencing a high volume of traffic to the post you may want to optimise the load time. You can do this by optimising any images, removing unnecessary images or multimedia, and removing or switching off any unnecessary plugins. Take advantage of the post traffic and monetise the post by adding another paragraph or two of content to make the article more relevant for your call to action. You can also add advertising or affiliate banners closer to or within the copy. If these methods don’t apply to your business, you can add important links to subscribe to your blog or newsletter, connect with you on social media, or link out to your other popular posts to encourage the reader to keep browsing. If the posts are already monetised and optimised, take a look at how you can improve the content. Is it persuasive? Are you leading the reader to the call-to-action? Does your content fill a need or answer a question? Do references or information need to be updated or expanded on? Look at your formatting to see if you make the key points of your post stand out more for increased readability. Use heading tags, bullet points, pull quotes or add tweetable quotes. Take a look at these posts and their associated tracking stats and comments. What makes these posts so popular? Once you figure that out do it again! Perhaps you notice a trend of a popular category, or maybe it’s question/answer formatting that your readers like, or maybe the posts have great photos. Whatever it is, use this knowledge to build your blog, audience and business.